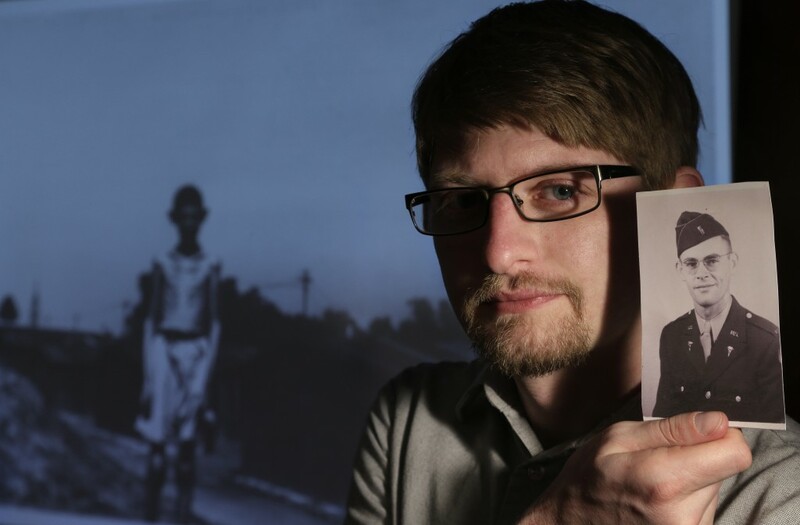 In 1995 I was living on Glenside Ave, a small side street off Glen Road and right next to Franklin Park. At the time, the Park didn’t have the best reputation — the word “stabby” comes to mind — so it wasn’t until late winter that my roommate and I made our way up the snowy path. We did it on a dare, mustering our bravery as we imagined all sorts of unnamed evils lurking behind the trees. The Glen Road entrance to the Park did not ease our fears. The first 300 yards are flanked with steep rocks, topped with a tangle of overhanging trees. We crept along, ears alert for any menacing sounds. At the top of the hill the rocks fell away and the ground opened up, the lane continuing on into a dark and scary trench. 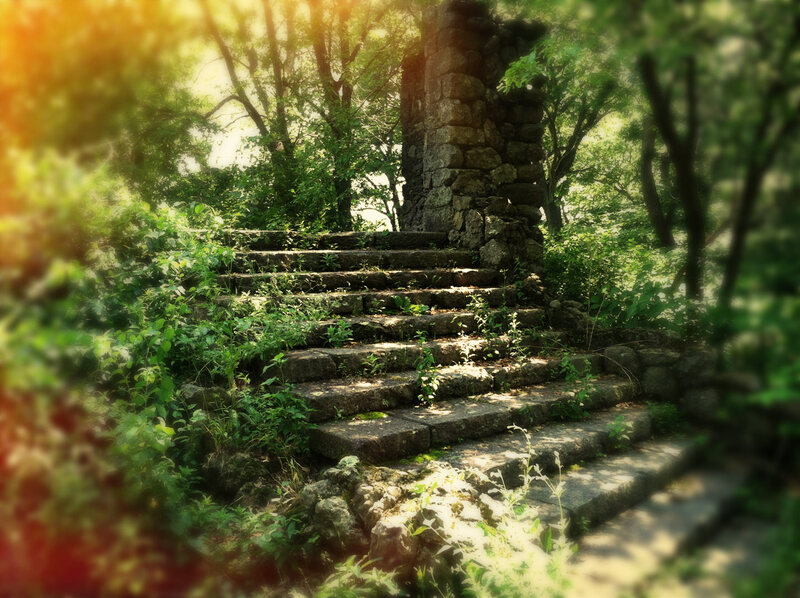 To the left was an overgrown hill, broken stone steps climbing up between twisted trees. We turned toward that ominous hill, coming up a small path to find huge crumbling stone steps, the ruins of a giant building. In the distance a wolf howled — or maybe I imagined it — and in the fading light it felt as if we had entered a bad horror movie. Our scene was the one in which the dumb kids stumble upon the horrible ruins and accidentally unleash some great evil. Creeped out, we turned back and made our way home, never to return. A postcard view of The Overlook from the promenade along the Playstead side of the knoll. Years later, now that Franklin Park is less “stabby” and my daily stomping ground for explorations, I know those creepy ruins as The Overlook. They are my favorite place in the Park, and I often eat lunch there. 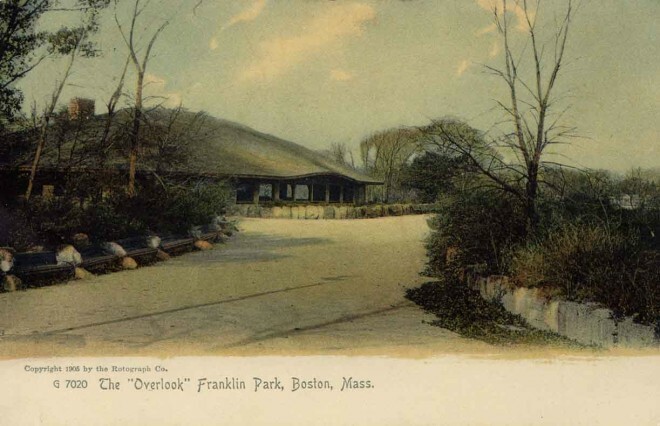 For me there is nothing that describes the past, present and future of Franklin Park like the story of The Overlook. 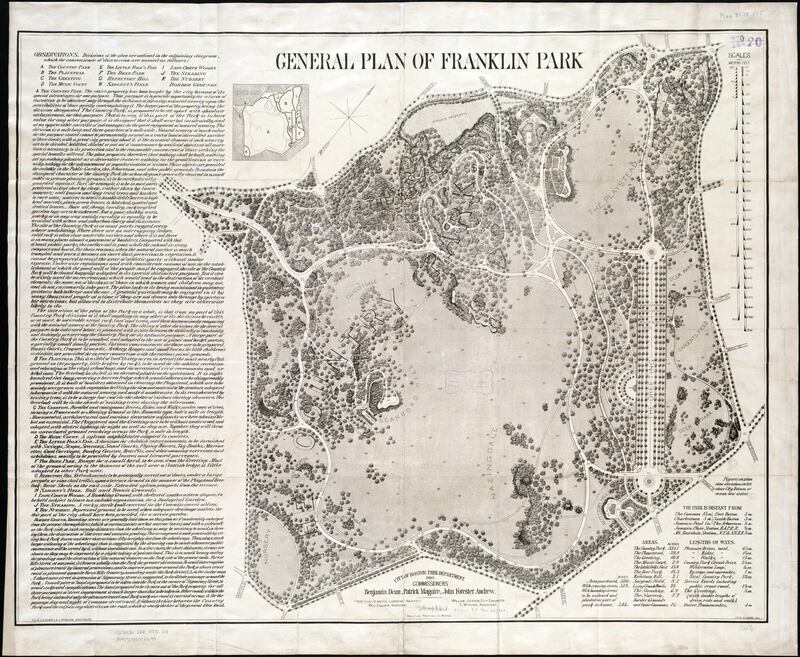 Olmsted’s Revised General Plan of Franklin Park. The Overlook is in the upper-right corner of the map, along the right edge of the Wilderness. For any of this to make sense, I have to start with some Park geography and Olmsted philosophy — and the importance of Glen Road. Olmsted’s General Plan of Franklin Park describes two distinct areas of the Park with very different uses. Each of these is divided again, for a total of four sections. Most of the Park is devoted to the enjoyment of nature, and includes The Country Park (now the golf course) and The Wilderness. 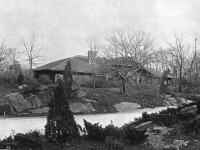 Olmsted said their “purpose is to provide opportunity for a form of recreation to be obtained only through the influence of pleasing natural scenery upon the sensibilities of those quietly contemplating it.” He wanted the Wilderness in particular to be untouched, as the Pilgrim’s would have experienced the virgin New England landscape. Postcard view of The Overlook from the Glen Road side of the hill. The other part of the Park was the Ante-Park, “to be used for the athletic recreation and education of the city’s school boys, and for occasional civic ceremonies and exhibitions. 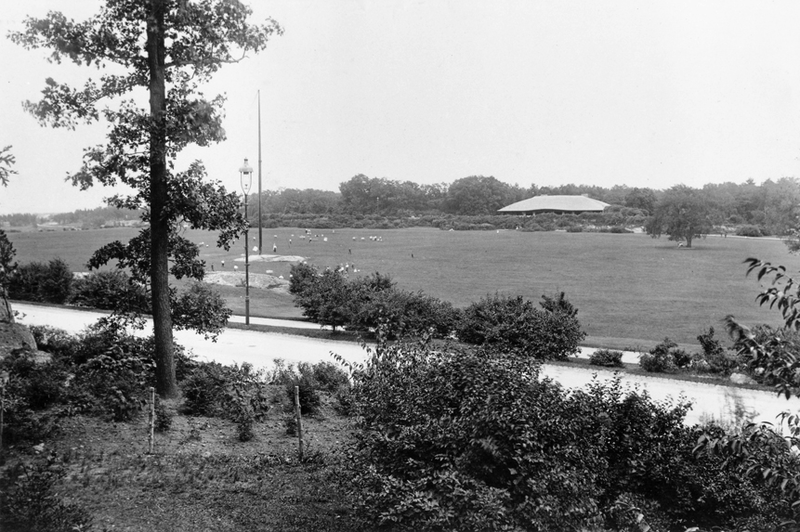 ‘The Overlook’ on its left is an elevated platform for spectators.” In the General Plan, the Ante-Park is divided into The Playstead (where White Stadium sits today) and The Greeting (now the Zoo). This area of the park was to be used for sports, events and “civic ceremonies” and philosophically separated from The Country Park in role, expectation and activity. 2013 view from the same spot as the postcard above, on the Glen Road side. 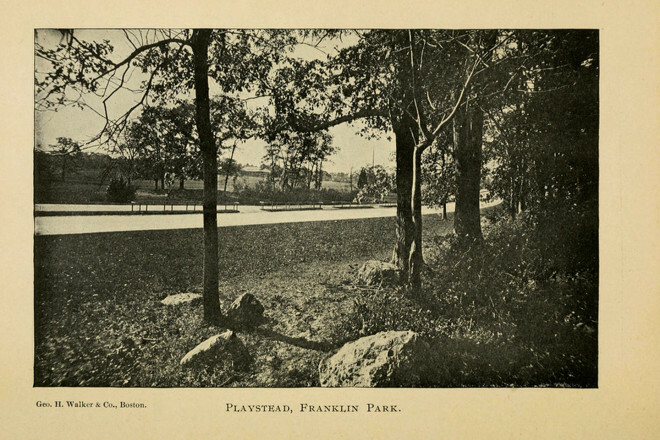 The two sections of the Park are divided by Glen Lane, which was designed to run along the edge of The Greeting (Zoo) and The Playstead, emerging on the western side of the Park as Glen Road, sloping downward until it meets Washington Street — Boston’s main thoroughfare in the 1880s as it is today — where it changes name to Green Street. A block further on is the Green Street stop on the MBTA Orange Line. As described above, Olmsted wanted The Overlook to be a place for spectators to watch the sports and events in the Playstead. 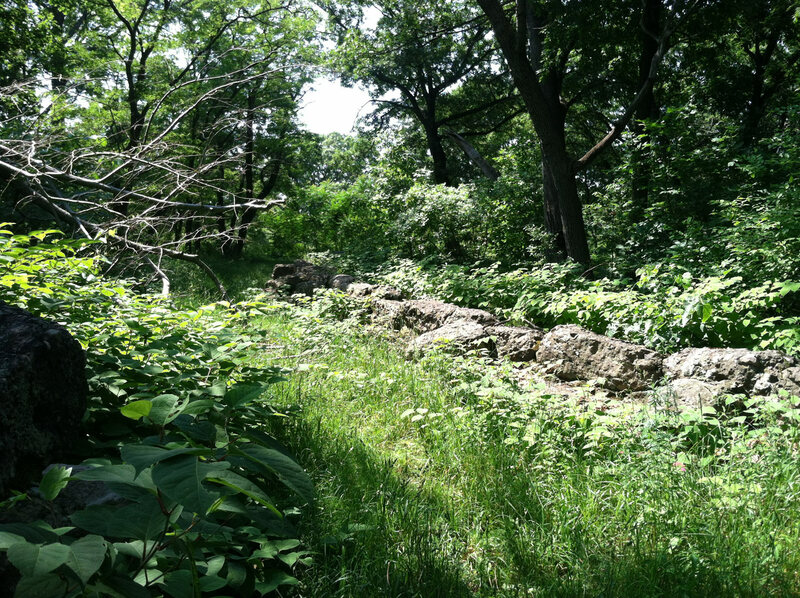 The location, a broad rocky knoll near the Valley Gates1 and abutting The Wilderness, joined the various philosophies of the Park in one setting. 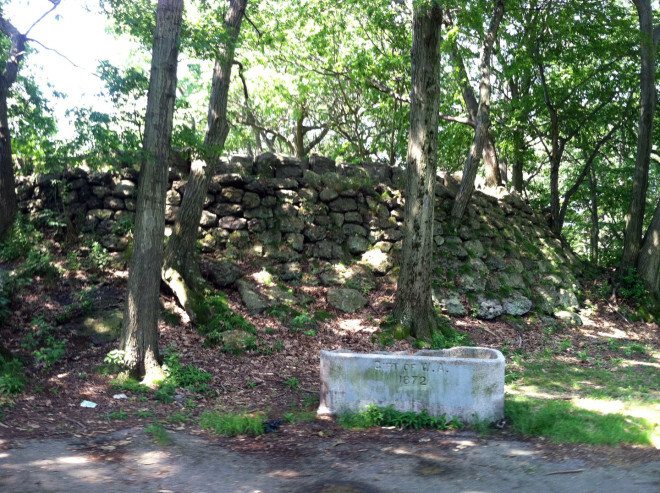 Panoramic view of The Overlook ruins. Vintage photo of The Overlook viewed across The Playstead, as seen from the Bear & Raccoon Cages. Today this view is blocked by White Stadium. Wood and stone benches along the promenade of The Overlook. The shelter is only part of The Overlook, however. Most of the area is taken up with promenades and viewing areas that, in Olmsted’s time, would have looked out over The Playstead. Today the view is almost completely blocked by trees. The promenade on the northern side of the building (today closer to White Stadium) is accessed by stone stairs typical of Olmsted, and spectators could walk along the front of the building and down into a wooded section lined by benches. These stone and wood seats were laid out along curving paths that traced the contours of the knoll, and defined by a steep stone wall that drops ten feet to the edge of the Playstead below. A tunnel in this wall allowed athletes to enter the lower level of The Overlook shelter, where they could use the changing area. Very little of this is at The Overlook today. The building “burned in the 1940s just before White Stadium was built” according to the FPC website. All that remains of the shelter are the three stone staircases, and the stone supports for the walls. A view of the wood and stone benches today. Here, I might pause my meditation and say that this was a terrible loss for the Park; that it was the end of the Olmsted vision; that it should have been rebuilt or that… whatever. I won’t write any of that, however, because I’ve come to realize that Franklin Park has never stopped being what Olmsted envisioned. The philosophy of the Park has not changed, even as the buildings and roads have. Even The Overlook, now burned and scary and ruined, continues to live up to Olmsted’s plan… but I’m getting ahead of myself. First, let me justify what I just said. I’ll take each area of the Park in turn, and compare their intended uses from The General Plan with how they are used in 2013. A vintage view of The Overlook shelter. The Wilderness is the easiest, since it remains essentially intact from the Olmsted plan. The abandoned picnic area on Hagborne Hill might be an eyesore, but otherwise the area is the kind of raw woodland that was planned. The Country Park is also the kind of place it was intended to be, and while I may complain (endlessly, some may say) about the golf course there is no disputing that golf was an intended sport for the Park, and that playing golf does get people out into nature — well, nature as defined and contrived by Olmsted. The Greeting was never built as planned, and became The Zoo early on in the construction of the Park. 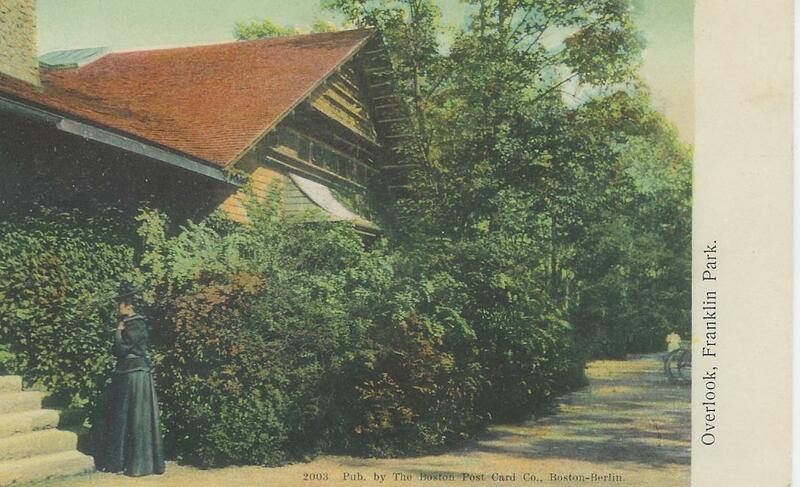 Olmsted was at the end of his life then, and his son took over the Zoo planning. Even though this was a major change to the plan of the Park, the Zoo is still in use as a public site, engaging people and educating them about animals, nature, and offering a “natural” respite from the city. Which leaves the Playstead — the area of the Park intended for “athletic recreation” according to the Plan. Well, whether or not White Stadium is the kind of thing Olmsted intended, it certainly is a place where “athletic recreation” takes place. The remainder of the Playstead continues to be used for “civic ceremonies” — my favorite each year being the Puerto Rican Pride festival because of the great food. Now, I doubt Olmsted could have predicted that popular sports would become more organized and demand a specialized stadium, or that civic events would include community pride festivals, but that doesn’t mean that those things don’t meet the vision laid out in the Plan. OK, back to the Overlook. Looking down into the footprint of The Overlook shelter from the central staircase. Standing today in the footprint of the absent building, I was struck by how big it must have been. I paced it out at 30 steps, so about 100 feet wide. I can’t even imagine how different the Park would have felt with such a large building looking down on the open fields of The Playstead, with men in top hats and women holding parasols strolling along the promenade. It just doesn’t seem… I’m struggling for a word here… possible… that such a large structure was on this site. 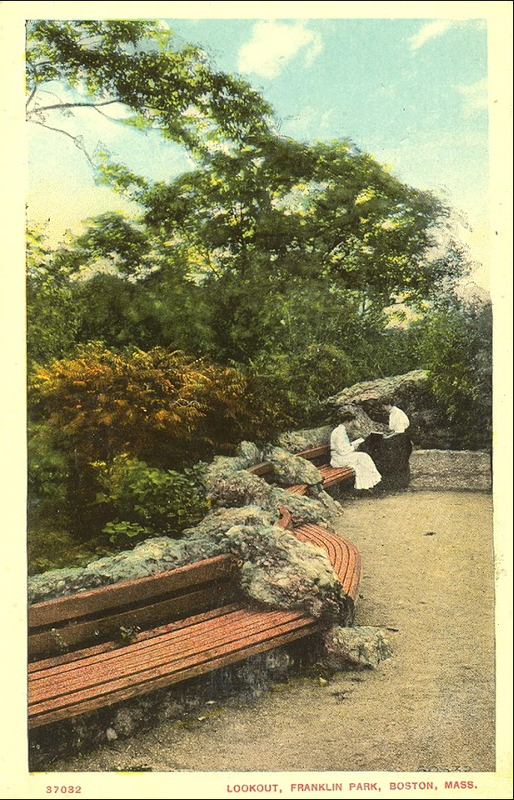 But the postcards show it during the heyday of the Park in the early 1900s, and the stone steps still stand today. Maybe that is what is so striking: in the postcards the building seems so modest, but in person its absence feels so large. The promenade and the tree-obscured view from The Overlook. A view of Elma Lewis’ Playhouse In The Park. 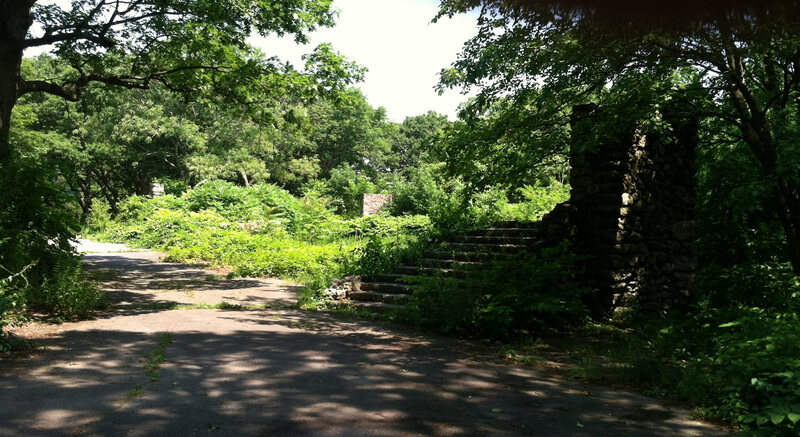 The story of The Overlook is like the history of Franklin Park encapsulated. It was built as part of Olmsted’s vision; burned during a time of national transition; was brought back to life by the community; fell to ruins along with much of the city; and now awaits another rebirth. Which is where I think I’ll end this story: the future. The FPC is “working on a plan to manage the landscape and bring the footprint of the old building back as a restored ruin” so that people can explore the stone steps and arches, see the beautiful views and enjoy it again. This means more people will be intruding on my quiet lunch spot, but that’s probably a good thing. Looking up at The Overlook, with the tunnel to the lower level of the shelter in the center of the image. Looking up at The Overlook, on the White Stadium side. In the foreground is a drinking trough for horses (?) that reads “Gift Of W.A. 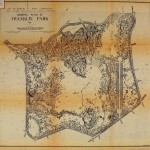 1872″ which means the trough pre-dates the construction of Franklin Park by 13 years. The Valley Gates are at the intersection of the four portions of the Park. If you’ve ever been to the Franklin Park Zoo, you’ve probably passed through them on your way to the parking lot that is on the edge of the Playstead. Poking around Flickr, I found a pair of interesting photographs that show The Overlook and Playstead as they were in 1899. I thought I’d add them to this post, since they show the area as very different than it looks today. 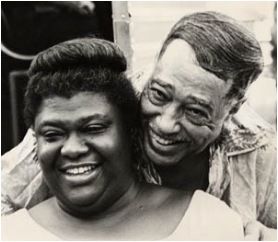 Check out this photo of Elma Lewis and Duke Ellington (found here). 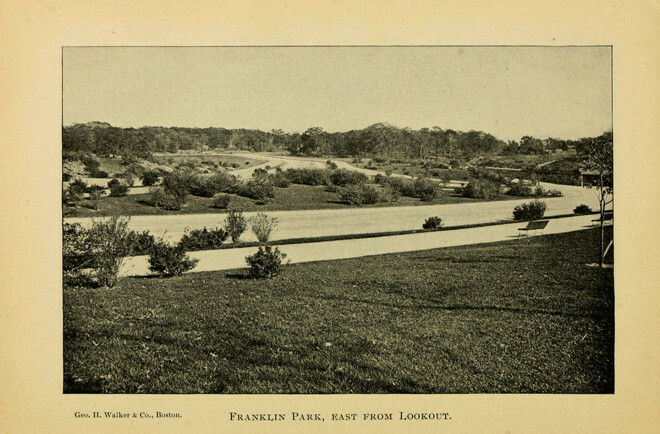 Yesterday I was poking around the website of the Jamaica Plain Historical Society and I found this photo of the Overlook from another angle. The woman in the foreground gives a sense of scale, and I thought it added a little to the post above.